This happened today. Three kids in school all day. One kid in preschool a couple hours a week. And one little boy who is home alone but refuses to take off his red “packpack”. I love when summer rolls around. I look forward to our summer roadtrip all year long. I love late nights in the pool. I love watching the kids play together. 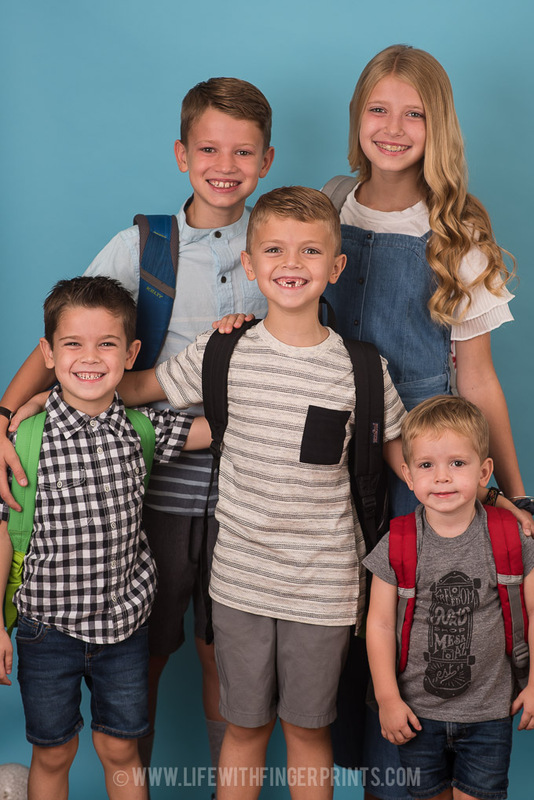 But as much as I love summer, I also love sending them back to school and so far, they love going back to school. I dread the age when they don’t get excited to lay out their outfits and get new school supplies. Fortunately, Hallie still falls into this category, although I can’t be sure how much longer she’ll last. They were all smiles walking out the door and just as I suspected, they were all smiles walking back in the door. I was most nervous about Hallie since she’s moved on to Junior High and navigating a new school, with a new schedule and new friends can be intimidating. But she walked in the door just as excited and happy as the rest of them and eager to tell the details of her day and I listened for as long as she would talk. And then when Steve got home, she went over all the details with him as well. This evening the boys collected paper bags full of things that represented them and Hallie sat at the table and did her math homework – and just like that our late night swim sessions are over. At least on school nights.